Vande Hei, Acaba and cosmonaut Alexander Misurkin of the Russian space agency Roscosmos landed at 9:31 p.m. EST (8:31 a.m. Feb. 28 in Kazakhstan) southeast of the remote town of Dzhezkazgan in Kazakhstan. Their time on station marked the beginning of the first long-term increase in crew size on the U.S. segment, enabling NASA to double the time dedicated to research and achieve a record-setting week of research that surpassed 100 hours. Highlights from this research include investigations into the manufacturing of fiber optic filaments in microgravity, improving the accuracy of an implantable glucoses biosensor, and measuring the Sun’s energy input to Earth. The crew also welcomed four cargo spacecraft delivering several tons of supplies and research experiments. Orbital ATK’s Cygnus spacecraft arrived at the station in November on the company’s eighth commercial resupply mission, followed in December by SpaceX’s Dragon spacecraft on the company’s thirteenth resupply mission. Two Russian ISS Progress cargo craft arrived at the station in October and February. Vande Hei logged 168 days in space on this, his first, mission. He ventured outside the space station on four spacewalks to perform work that included replacing and lubricating the Latching End Effectors on both ends of the Canadarm2. Acaba completed one spacewalk to lubricate an end effector and install new cameras on the station’s arm and truss. He now has accrued 306 days in space on three flights. Acaba and Vande Hei also participated in dozens of educational events while in space as part of NASA’s Year of Education on Station. Misurkin conducted one record-setting spacewalk with fellow cosmonaut Anton Shkaplerov to replace an electronics box for a high-gain communications antenna on the Zvezda service module in February. The spacewalk timed out at 8 hours and 13 minutes, the longest in Russian space program history. Misurkin now has spent 334 days in space on two flights. Now operating the station are Expedition 55 crew members Commander Anton Shkaplerov of Roscosmos and Flight Engineers Scott Tingle of NASA and Norishige Kanai of the Japan Aerospace Exploration Agency. 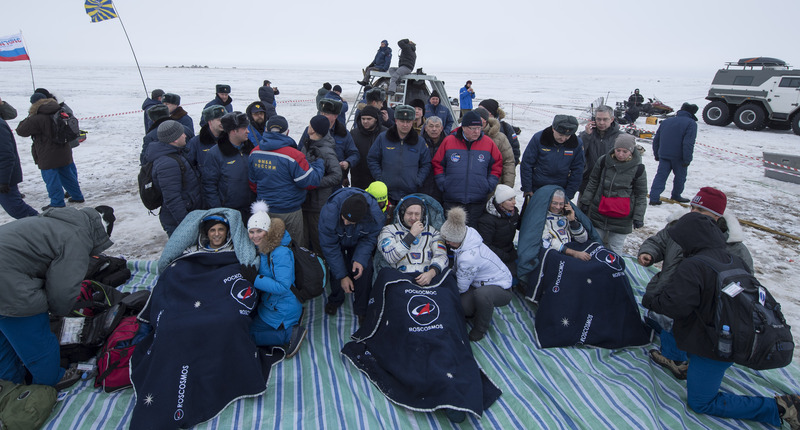 Astronauts Ricky Arnold and Drew Feustel of NASA, and Oleg Artemyev of Roscosmos are scheduled to launch March 21 and arrive at the space station two days later, returning the crew size to six. Bonita foto. Esperamos que nuestros astronautas y cosmonauta estén bien de salud. Fue un buen grupo de trabajo. Thanks! May the force be with you! 21 Century Science,the best.